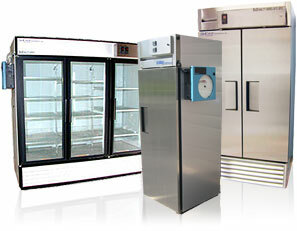 Where regulatory requirements and high-value research often require validation and 24/7 monitoring for environmental stability rooms and chambers, BioCold offers a wide variety of monitoring instrumentation and validation services, ranging from basic chart recorders to 21CFR11 compliant, network data logging systems and onsite validation services. NEW! BioCold stability testing chambers feature 21 CFR part 11 compliant touchscreen controls, remote operation/monitoring, trending and datalogging, with full communications (USB/COM/Ethernet). Honeywell circular chart recorders are available in single-pen and dual-pen models for tracking temperature and/or humidity on a 10" diameter, 7-day circular chart. Chart recorders represent an economical, straightforward means of recording data, and are available with a calibratable digital display. Paperless data loggers are the option of choice for many facilities, providing a secure, stand-alone data acquisition system which is available with 21CFR11 compliant software to satisfy FDA regulatory requirements. Modbus controller communications provide both convenience and peace of mind when high-value product or research is being stored in a controlled environment or stability room. Modbus communications allow remote monitoring and control of all environmental room or chamber controller functions, including temperature readings, setpoints, and alarm outputs. Secure software is not yet available for the controller communications. NIST-traceable certificates of validation are available for all temperature and humidity sensors and controls. Executable IOQ protocols are available for all FDA/ICH stability and explosion safe stability rooms and chambers.